USB is becoming the charging standard of the world, that is that most devices seem to terminate in the good ol’ USB at the end, and you’ve got to plug that in somewhere to recharge the precious power, right? The Kinkoo 40W USB port charger can do just that, and at only $35. 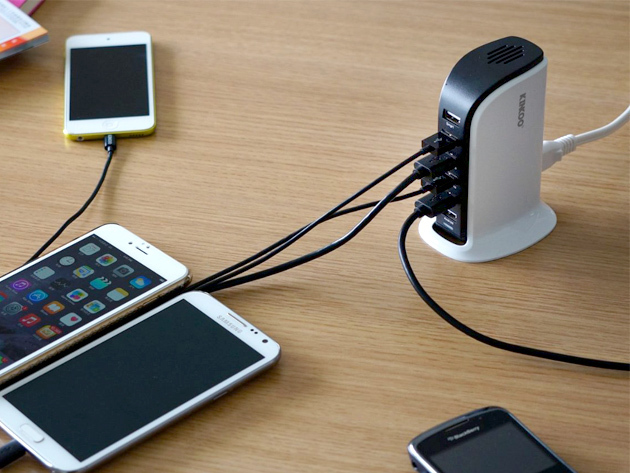 6-Port USB chargin’ station by Kinkoo can charge it all. Power is indeed a precious commodity, something we must be weary about due to current battery technology. This powered USB port power is more than meets the eye, too. While not a proper hub, this bad boy (or girl) can charge faster and with cleaner power delivery than you might think possible. It can dynamically switch where those magical amperes are going so that the most demanding of devices is charged the quickest and most efficiently. 40W is a lot of power to dedicate to charging, meaning that quick-charging is a reality here. Kinkoo 40W 6 port USB charging station, only $35, 29% off the regular price. Not bad for the gadget horder’s like myself.